Click here to watch the Lap and Sector times video. To access the Lap And Sector Times table, go to Results > Lap/Sector Times or click the button in the toolbar. The "Lap and sector times" table is the most convenient way of checking either lap times or sector times for all the runs currently loaded. Once you've added a lap marker to the track map, the lap times will automatically appear in the table - once you've defined sectors for the track then you will also get sector times for each lap. Mini bar-charts are shown along with the lap/sector times, so you can quickly identify fast and slow lap/sector times. 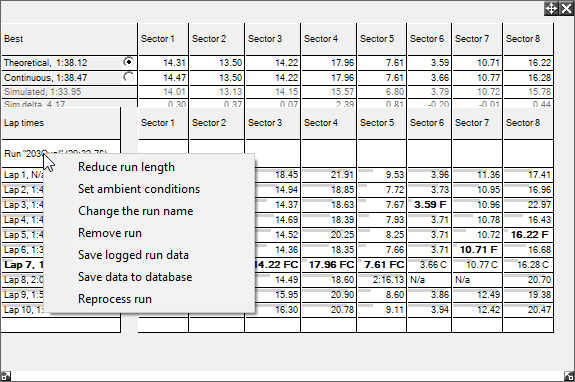 The Lap And Sector Times will list the times for all the runs loaded into the software, and will be displayed minutes : seconds : hundredths of a second where the time is greater than or equal to 60 seconds, and seconds : hundredths of a second where the time is less than 60 seconds. The current fastest lap and sector will be highlighted in bold and be followed by a small chequered flag. Fastest theoretical lap which is made up by adding together all the fastest sectors are marked with a “F” and the fastest continuous lap with a “C”. Theoretical � this is the fastest sectors off all data currently loaded and added together to give you a lap time that you would have got. You can specify options that effect a specific run by right clicking on that run. 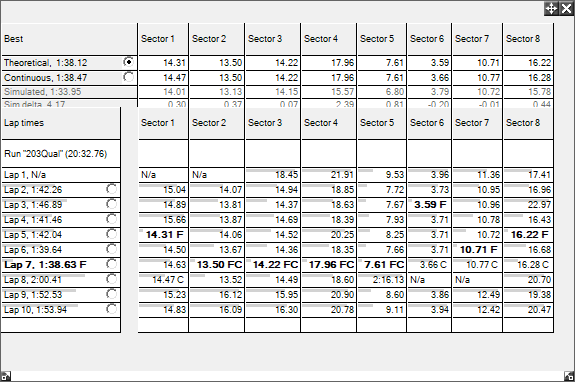 You can highlight data in the Lap And Sector Times table for analysis in XY graph, the bar chart, the values tables, the summary statistics, the performance calculations table and the virtual dashboard. Selected areas will also be highlighted on the track map. Please note that you can only select data ranges from one column at a time. While you cannot compare sector 1 with sector 2, you can compare Run 1 with Run 2. This is useful for comparing different drivers or car settings etc. button. This will open up the Quick XY Graph, click here for more information on Quick XY Graphs. You can also look at the data using interactive mode in several other results windows. Click here for more information on interactive mode. 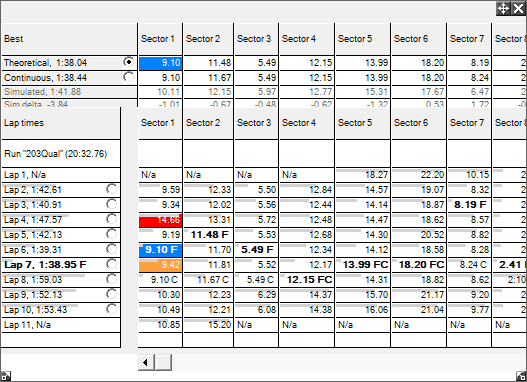 For more information about automatically adding lap markers and sectors, Click here.